What is Episerver Digital Commerce? Episerver Digital Commerce is a comprehensive eCommerce platform loaded with premium features and offerings that will help your business succeed online and take your company to higher heights. 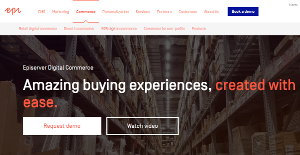 With Episerver Digital Commerce, users are given a powerful solution that combines content management and digital marketing capabilities, enabling them to be in absolute control of their customers’ experience. With powerful and engaging content to highlight your company’s products and services, you provide your clients with the best information and great buying experiences to encourage them to perform your desired actions. Thus, your revenue increases and your business grows. By integrating content management and marketing, Episerver Digital Commerce users get the best of both worlds with great features including content targeting, on-page editing, unification of content and commerce, and more. Episerver Digital Commerce gives companies a complete platform that enables them to provide amazing purchasing experiences for their customers, resulting in the unhindered growth of their business. This online commerce solution takes the core components of content management and digital marketing so that businesses are able to deliver a more personalized product experience for their customers across multiple channels. With Episerver Digital Commerce, merchandisers are equipped with the tools and features to help them fully optimized their commerce marketing efforts. Users can perform effective merchandising with ease, thanks to a very robust and intelligent campaigns tool that comes with the platform. Simply put, you have all your products, discounts, and assets placed in a single, centralized location so you don’t have to exit the application and start a new one. The system also offers users pre-built connectors that link smoothly with existing PIM, ERP and marketing automation systems among others. These connectors accelerate many processes and workflows, ensuring streamlined rapid time-to-value and optimum performance while effectively mitigating risks and expenses for maintenance and implementation. Marketing teams love how quickly they can add, upload, and edit their online content. Episerver Digital Commerce allows them to see what their content would look like in real time and in multiple interfaces (i.e. desktop, smartphone, tablet). By seeing what their content would look like prior to going love, marketing teams are empowered to deliver high-quality content that delivers results. If you are considering Episerver Digital Commerce it could also be beneficial to analyze other subcategories of Best eCommerce Software collected in our database of SaaS software reviews. Since each enterprise has particular business needs, it is sensible for them to abstain from seeking a one-size-fits-all faultless software solution. Needless to say, it would be futile to try to find such a system even among popular software applications. The intelligent thing to do would be to catalog the various essential elements that need consideration such as required features, budget, skill levels of staff members, company size etc. Then, you should do your groundwork thoroughly. Read some Episerver Digital Commerce reviews and investigate each of the other apps in your shortlist in detail. Such comprehensive homework can make certain you discard ill-fitting systems and select the system that presents all the aspects you require for business success. How Much Does Episerver Digital Commerce Cost? Contact Episerver Digital Commerce for enterprise pricing information and other product details. You can also submit a request for a demo to see if the software is a perfect fit for your business. We realize that when you make a decision to buy eCommerce Software it’s important not only to see how experts evaluate it in their reviews, but also to find out if the real people and companies that buy it are actually satisfied with the product. That’s why we’ve created our behavior-based Customer Satisfaction Algorithm™ that gathers customer reviews, comments and Episerver Digital Commerce reviews across a wide range of social media sites. The data is then presented in an easy to digest form showing how many people had positive and negative experience with Episerver Digital Commerce. With that information at hand you should be equipped to make an informed buying decision that you won’t regret. What are Episerver Digital Commerce pricing details? What integrations are available for Episerver Digital Commerce? If you need more information about Episerver Digital Commerce or you simply have a question let us know what you need and we’ll forward your request directly to the vendor.